Riverside Cottage is in a lovely, peaceful location, just yards from the banks of the River Coquet in the centre of a rural village. The master bedroom has traditional window seats and offers beautiful views over the river and the village of West Thirston. 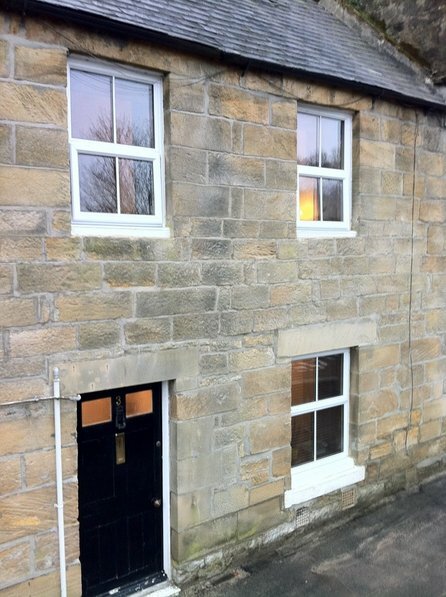 The Cottage offers excellent accommodation for four people, with two bedrooms: one double bedroom and one twin bedroom. It has full gas central heating with a warm and cosy lounge with open fireplace, original wooden window shutters, 32" LCD TV with Sky HD and DVD system. The dining room has a unique cast iron bread oven in it's own fireplace, a beamed ceiling and comfortably seats four people. The modern kitchen is fully equipped and offers an electric oven with gas hob, microwave, family sized dishwasher, washing machine and dryer and a fridge/freezer. There are two bathrooms in the property: one being a downstairs cloakroom and the main bathroom upstairs, both have modern fixtures and fittings. There is also an outside seating area. We are happy to accept one well behaved dog at this property and there is a pet fee payable with your booking. Please enquire if you have more than one dog and let us know the breed and we still may accept your booking. A range of amenities including local shops, post office, café and a charming country pub with restaurant are all within easy walking distance of the property. There are numerous local tourist attractions, riverside walks and scenic countryside within the immediate vicinity. Don't forget to bring some bread along to feed the ducks by the river! The stunning coastline of Northumberland is just a short distance away. Riverside Cottage is the ideal base to explore all that Northumberland has to offer, from it's famous castles and award-winning beaches to walks, cycling, golf, water sports and fishing or one of the county's many attractions. Please note that changeover days at Riverside Cottage are strictly Saturday.